That saying was borrowed from the Rifleman’s Creed and was spoken in jest over the years referring to our uniform patch. “There are many like it” was a poke at its generic design that was adopted by police and security agencies across the nation. It became a running joke about how many different agencies had the same design. But it was ours. The consensus over the years was that APD needed an upgrade. In 2006, the command staff at the time started contemplating changing the patch. When I was promoted to lieutenant in 2008, a committee was formed to seek input and design a new patch. We gathered feedback from officers and quickly learned that people wanted different things in their patch. Some wanted buildings to reflect our downtown. Others wanted patriotic flags and bald eagles. Some wanted skulls and crossbones (that didn’t make the cut!). It seemed that every human had a different idea of what it should be. So, we mocked up as many elements as we could and presented it to the 7-person command staff. I recall laying out the designs and taking a step back as they studied the patches. Their discussion turned into dissent as they voted on their favorite. That morphed into suggestions of different designs they wanted to see incorporated with no one agreeing on the same ideas. I walked out of that room thinking the chief was going to have a tough time sifting through all the opinions and settling on the winning patch. I never heard another word about it. That taught me a few very important lessons. First and foremost, a patch is in essence, art. The beauty of art is in the eye of the beholder and all of us are drawn to diverse interpretations of beauty. It also taught me a leadership lesson that is applicable to every decision made in an organization: someone will invariably be unhappy. That’s why so many leaders stay with the status quo. It’s easier to keep things as they are so as not to incur conflict. But APD doesn’t do easy. 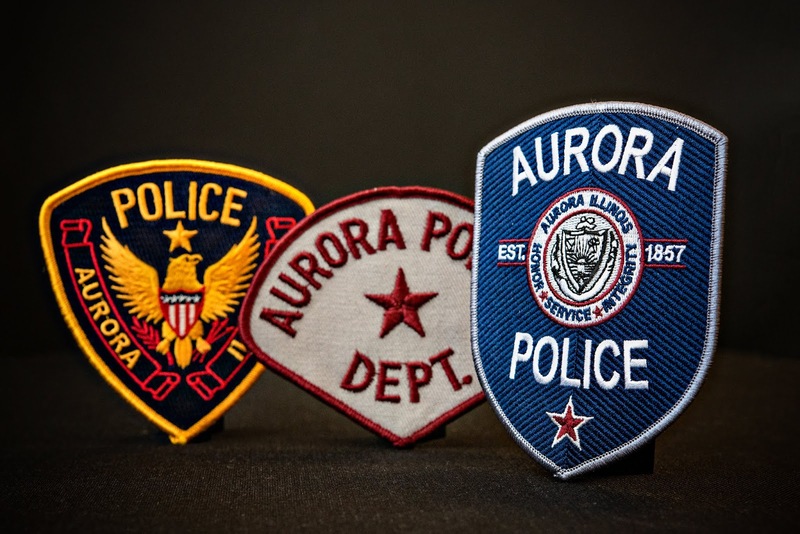 It was important to our command staff that we honor our past, so we sought out to research the APD patch that was used prior to 1969 where the first pictures of our current patch surfaced. The patch from 50 years ago was a simple design with a gray background and a maroon border and a maroon 5-point star. 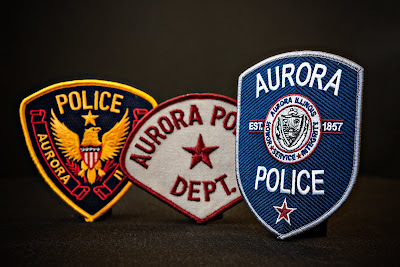 It simply said, “Aurora Police Dept” and that patch became the inspiration for the new design. 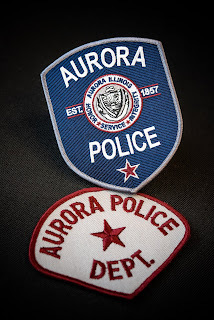 We decided to steer clear of buildings or landmarks in Aurora because once again, those are opinion-based elements. We opted instead to place the official City of Aurora seal in the center of the patch because it hasn’t changed since 1857. We wanted to honor our past but give it a modern and clean look with our values: Honor, Service, and Integrity. The result is our new patch adopted in 2019. This is a change I do not take lightly. And as much as I wanted to upgrade the design, the first time I put on the uniform with the new patches, I was flooded with emotion. My dad wore that patch for his career, and it was part of my childhood. It was symbolic of APD. I have worn our patch since 1994 when I became a police officer. Officers who have left this earth have worn it. Our beloved retired officers have worn it. Our current officers wear it and it is a part of all of us. It will always be our patch and it will remain in our legacy. Tradition is a fragile thing in a culture built entirely on memories and there can be no creation without tradition; my hope is that the new patch is a reflection of our past. Our police department is not the same as it was in 1969. It is exactly 50 years later, and we respect and honor our past, but we evolve and grow into our present. Our police officers and civilian staff are bold, innovative and progressive. Our new patch is symbolic of these characteristics and we wear it proudly because it is our patch. There are many like it, but this one will become ours. For the past two years, I have been pursuing a second Master’s Degree from the Naval Postgraduate School Center for Homeland Defense and Security (CHDS). 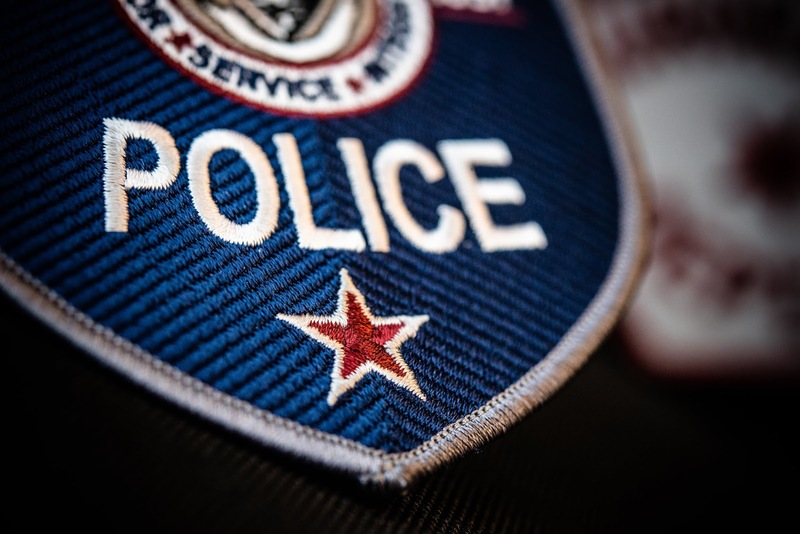 I pursued this degree so I could be a better chief for my department and become more educated on homeland security issues in order to keep our city safer. When I began this program, I didn’t set out to abandon my blog (and nearly everything else in my life). It just happened. 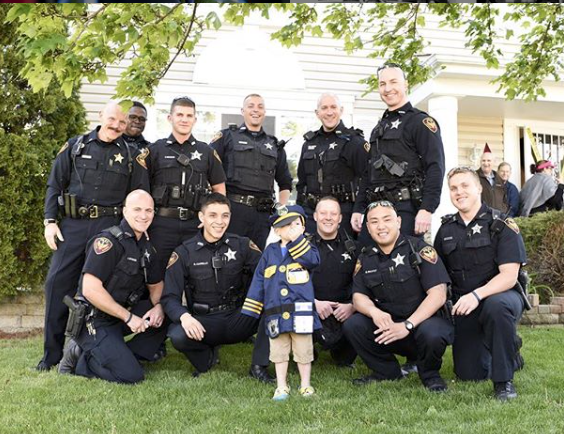 I live by the mantra, “Do what you have to do so you can do what you want to do.” Following that mindset, I have tried to prioritize my police department while using energy reserves for the grueling coursework and traveling back and forth to California and Maryland for the residency portion of the program. That has left me with little time to do what I want to do. Newton's first law of motion observed that an object at rest stays at rest and an object in motion stays in motion. 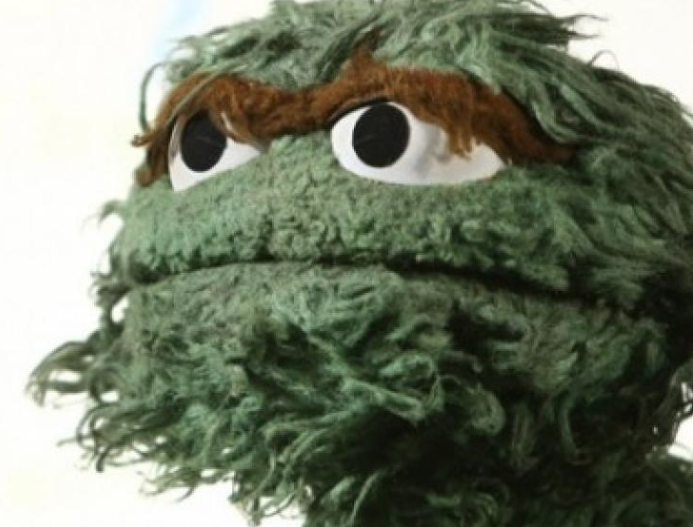 By that theory, I should have been in a constant state of inertia. Newton’s law didn’t account for immovable objects in the way of things in motion because I lost count of how many times I slammed into a brick wall. I should also mention that I have neglected friends and family during this time and that’s why I think it’s ironic when I’m asked how I manage work-life balance. I remember reading Facebook COO Sheryl Sandburg’s book, “Lean In” where she described reaching a point in her career where she felt comfortable leaving work at 5pm to have dinner with her family. She made it a rule not to allow anything to interrupt dinner and she hoped by practicing putting her family first, it would give other people at Facebook permission to do the same. I love that. But I don’t do that. I am blatantly honest when answering the work-life balance question by confessing that I don’t manage it at all. I fail at it miserably. When I’m eating dinner with my family, I answer the phone when it’s someone from work – even if it’s not an emergency. I swear I have tried to ignore it but then I start speculating what needs my attention and I become preoccupied. My family just looks at me looking at the ringing phone and tells me to answer it. The truth is, when I feel like I'm entirely focused on work, I know I'm not fully present for my family. When I am being a great mom and a great partner, I feel as though I’m falling short in my police department or my city. Throw in the pursuit of another master's degree into that mix, and it's easy to see why I repeatedly slammed into the wall. Some people say you can have it all and I absolutely believe it – just not at the same time. I graduate in December with a Master’s Degree in Homeland Defense and Security and I loved every minute of it (except for the times I didn't love it and wondered what the hell I was thinking). I'm proud of my accomplishment, but I’m relieved that it’s coming to an end because I will be clearing the cobwebs off my blog and getting back to reading books that aren’t assigned and writing about things that aren’t required. I did what I had to do. Now I get to do what I want to do in between the things I still have to do. And if the phone rings during dinner, I’m probably still going to answer it because getting a degree doesn’t make one smarter.